Prawn laksa hits all the right flavour notes- spicy, savoury and a hint of sweetness; surely it has to be one of the best Asian comfort foods around? Laksa is usually found in Malaysia and can include many main ingredients such as chicken or tofu- prawn is just the start or you can always mix and match! Don’t be put off by the shrimp paste or fish sauce- they are there to season and add depth so do try them. The spice paste can be made well in advance and then kept in the fridge. You may also like to make more paste than you need for one meal and then save it for another day to save some time. This laksa includes beansprouts which are readily available in supermarkets. You may also like to include shredded vegetables such as mange tout, sugar snap peas or Asian greens- it really depends how hungry you are! 1. Start off by soaking the kashmiri chillies whilst you prepare the remaining ingredients for the paste. Blitz into a paste or bash using a mortar and pestle if you prefer a more rustic look. 2. Take a large pan and heat the glug of vegetable oil over a medium heat. Cook off the paste for a couple of minutes until it releases its fragrance. Add the coconut milk, stock, fish sauce and palm sugar and simmer. How long I simmer this for depends on how much time I have but aim for around 10-15 minutes so the flavours from the paste has time to develop and infuse. 3. Meanwhile soak the rice noodles in boiling water, drain well and set aside. Pop the prawns into the broth to cook through whilst you divide the noodles between two deep bowls. Alternatively, and I know this is not the true way of doing it, but I also like to add the rice noodles to the broth and finish off in that so it soaks up the fragrant sauce. When the prawns are cooked, ladle the broth over the noodles before going in with the beansprouts and spring onion. I also like to fry rings of shallot to give a crispy topping. Prawn laksa- spicy, warming, comforting and impossible to resist! Beef khao soi brings a taste of Thailand to the comfort of your own home. It is a delicately spiced and fragrant curry noodle soup that is perfect for a chilly evening. I have added some mixed vegetables to this recipe to make it even heartier. It can be served with a range of meats and prawns but I have kept this recipe as simple as possible by using minute steak. This cut of beef is perfect as it cooks quickly whilst retaining its tenderness so give it a try! I have included my recipe for red curry paste which forms the base of the recipe but if you’re short on time you can use a ready made paste. The paste also keeps well in the fridge as long as it’s kept in a well sealed pot so you can make a bigger batch at a time. 1. Start off by making the curry paste by toasting the coriander and cumin seeds in a small pan over a medium heat. As the spices start to release their fragrance, remove from the heat and set aside to cool slightly before grinding in a spice grinder or pestle and mortar. Add the rest of the ingredients and combine to form a thick paste and you are good to go! 2. Heat a small amount of vegetable or groundnut oil in a wok and fry off the curry paste for a few minutes until it starts to release its flavours. Add the coconut milk and stock and stir well to combine. Increase the heat and bring to the boil before lowering to a simmer. I simmered it for around half an hour so it begins to reduce down and the flavours develop. 3. As the coconut milk is simmering, cook the noodle nests according to pack instructions. Set 2 nests worth of noodles aside for later and use one to make the crispy noodle topping. To do this, heat a good amount of oil in a deep pan over a medium/ high heat (remember to keep a careful eye on this!). Take some of the noodles at a time, trying not to overcrowd the pan, and fry until they crisp up and go a little golden. I used a slotted spoon to turn them over during cooking to get an even colour. Remove from the pan and blot onto kitchen towel. 4. When you are nearly ready to serve, add the mixed vegetables and spring onions into the wok to simmer for a couple of minutes before removing the wok from the heat and adding in the beef strips. I found that the delicate strips of beef cooked well in the residual heat but you could keep it on the hob on a very low heat if you prefer. 5. Divide the two noodle nests between two deep bowls. I used a slotted spoon to add on the beef and vegetable mix before using a ladle to spoon over the broth. Top with the crispy noodles and watch your fellow diners’ faces as you present this beautiful curry soup to them! 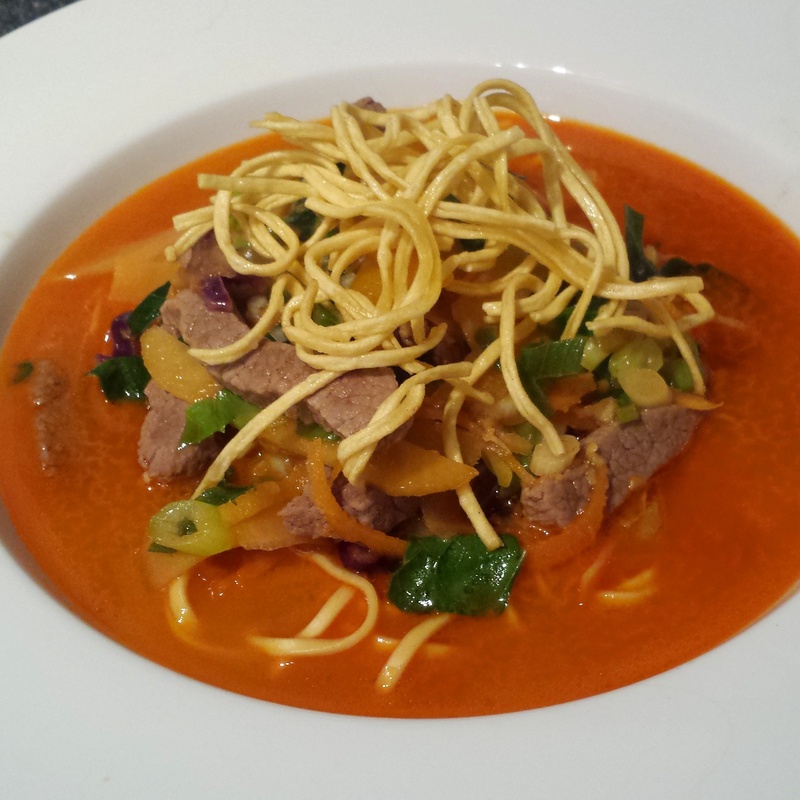 Beef khao soi with cispy noodles- fragrant, delicate and oh so moreish! Spicy prawn noodle soup is like a giant hug in a bowl for the soul and the stomach. It combines the sweetness of prawns, the freshness of vegetables, the lightness of broth with a punch! I made my own stock from prawn shells and a few additions as you will see however if you are short on time you could use a readymade stock but it really is worth the effort to do your own. 1. Kick off by removing the prawns from their shells. Take a large, deep saucepan and add a splash of vegetable oil and heat this over a high heat. Cook the prawn shells until they turn pink. Add a litre of water and bring to a gentle simmer. Leave this for half an hour before straining and reserving the water- you can discard the shells at this stage. Add the water back into a clean saucepan and infuse with the ginger, lemongrass and spring onion; these will all be removed later and won’t be in the final dish so sling them in and off you go! Simmer again for at least 30 minutes but longer if you can so the flavours can develop. 2. When you are nearly ready to use the stock, remove the ginger, lemongrass and spring onion and discard the prawn shells. Skim off any impurities from the surface of the stock and strain well. Now comes the time to season the stock so you must taste as you go. Add the soy sauce, fish stock and palm sugar as stated in the ingredients list but tweak to suit your tastes. Fish sauce and soy will add the salty edge the broth needs so go easy. Give a squeeze of lime to add a little acidity. 3. In a separate pan, add a splash of oil and heat over a medium heat. Add the sugar snap peas, bamboo and the white part of the pak choi. If you like a spicy broth you should add the chilli in at this stage too; if you prefer it to be milder then add it in at the end to serve. Cook the vegetables for a couple of minutes before adding the broth back into the pan. Bring it back to a simmer before adding the prawns and pak choi leaves to cook. The prawns will go blush pink when ready. 4. Meanwhile, cook the rice noodles according to packet instructions and drain well. I give mine a minute less than it suggests as it will be in the broth so you don’t want soggy noodles. Take large bowls for serving and divide the noodles between them. Ladle over the finished broth and finish with a little extra chilli or coriander if you like. 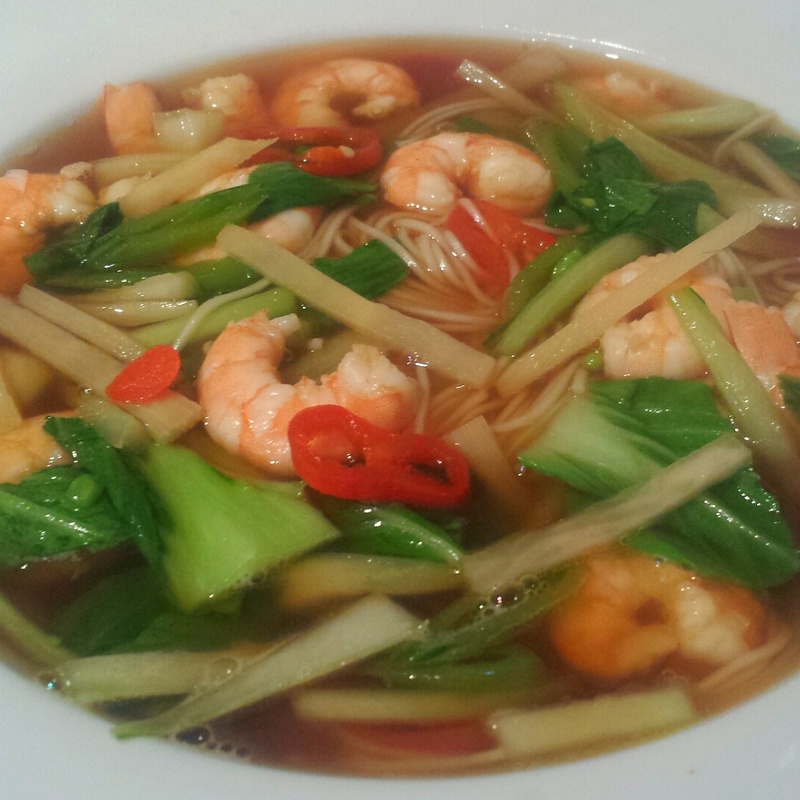 Spicy prawn noodle broth- the perfect meal for a chilly evening as autumn looms! If there’s one meal sure to perk up your day or restore you if you’re feeling under the weather then it’s this! A big, steaming bowl of noodles suspended in a delicate broth is just what the doctor ordered. Be creative with the vegetables you use, I have used a classic combination but also think about what is in season as well. 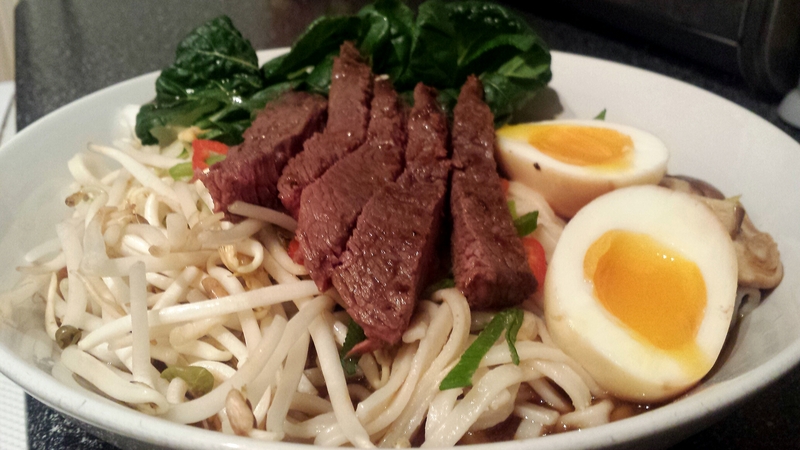 Ramen is traditionally served with pork, chicken or tofu so I have given it a twist by using beef. 1. First thing’s first! You need to get cracking (get it?!) on the eggs in advance if you can. Simply boil the eggs for 5 minutes until they are soft boiled and plunge them into cold water to stop them cooking further. Allow to cool until you can handle them enough to peel the shells. Meanwhile, in a small pan, heat the soy, water, mirin, ginger and garlic and bring to a boil. When it boils take it straight off the heat and allow to cool. When the soy mixture has cooled place into a freezer bag and drop the eggs into it. Squeeze the air out of the bag and seal to allow the eggs to marinade for 6 hours before using. 2. For the broth I recommend getting hold of ready made dashi stock (unless you want to make your own) which is now available more readily. Heat the stock in a pan and slowly add in the miso paste until dissolved into the stock. Add the garlic and ginger and bring it to a gentle simmer for 10 minutes. Do not boil this as miso does not like it! With two minutes to go from the end of simmering, pop in the white parts of the spring onions and the sliced mushroom. 3. While the stock is simmering you need to cook the steak and the noodles. You may like to marinade the steak lightly with some soy, garlic, ginger and mirin but it wil be just as delicious by itself if you like. Cook the steak to your liking and rest before cutting into thin slices. Meanwhile the noodles also need to be cooked according to packet instructions so everything is ready to assemble. 4. Use a large, deep bowl to serve the ramen. Layer up the bowl with a nest of noodles at the bottom and then arrange the cooked mushroom, beansprouts and greens before ladling over the broth. I didn’t cook my greens before serving to give more crunch but they could be wilted beforehand if you prefer.Spinach would also go well if you prefer. Play around with the combinations of vegetables that you use too. The vegetables will relax into the broth after a couple of minutes but the photo above is just after it’s been served- it was too delicious to remember to take another photo after this! Top the ramen bowl with the slices of steak, green parts of the spring onions and slices of chilli and give the final flourish with the eggs which need to be cut in half and served. If you have managed to achieve a soft boiled egg then the yolk will still be slightly runny even though it has been refridgerated. Beef ramen- a foodie hug for the soul!